UV is versatile technology used for disinfecting water, other opaque liquids, hard surfaces and air. Using the same germicidal rays as the sun, but hundreds of times stronger UV offers a reliable, cost effective, environmentally friendly alternative to chemicals and their resulting biproducts. UV Sterilization is a purely physical process not a chemical one so it doesn’t alter water’s chemistry, taste, smell or pH. All living organisms contain DNA (Deoxyribonucleic Acid). DNA provides the mechanism for all functions needed to sustain life. UV disinfection systems emit UV light that penetrates the outer cell membrane of microorganisms, passes through the cell body, reaches the DNA and alters the genetic material. The microorganism is thereby destroyed in a non-chemical manner and is unable to reproduce.When organisms absorb UV light in the range of 200-300nm, DNA and RNA molecules absorb the UV. The DNA molecule contains all the genetic information needed for replication. 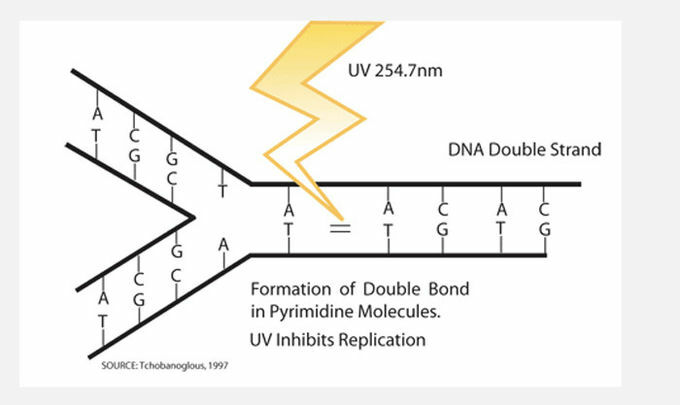 UV absorption causes disruption of the nucleic material of the double helix strands. This prevents replication, which is lethal to the cell. The absorption of UV radiation at 254nm causes the formation of dimers along the DNA strands. Dimers are A_A (adenine - adenine), GG (guanine -guanine), T-T (thymine-thymine) compounds as opposed to the normal formation of A-T-G-C- etc. If the dosage is not optimized, then complete inhibition of replication WILL NOT occur. On the other hand, an insufficient UV dosage may cause limited damage to the DNA, which then can, under favorable conditions, repair using repair enzymes. That's why it is extremely critical to impart the OPTIMUM UV dosage to prevent repair. While bacteria have built-in repair enzymes, viruses do not. Therefore, they have to rely on the enzymes of the host cell. 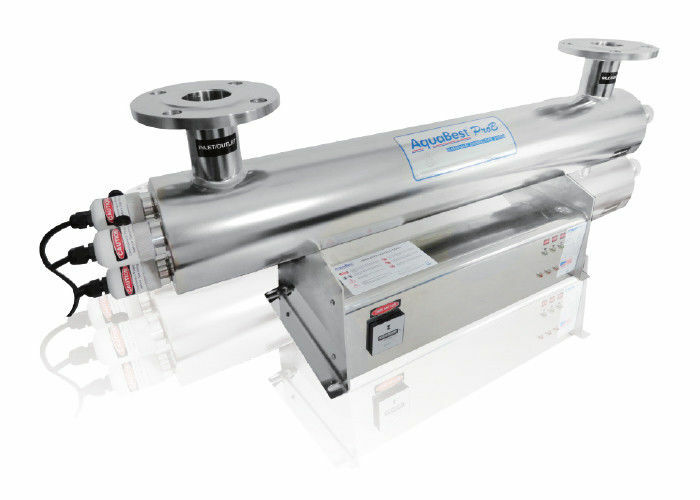 In ultrapure water applications, Our UV systems are used for the effective reduction of organics, commonly referred to as TOC otherwise known as Total Oxidizable Carbon. UV light in a 185nm wavelength promotes the formation of free radicals, leading to the oxidation of organics into CO2 and H2O and is more powerful than the 254nm used in disinfection applications. Efficient in high volume ultrapure, waste or reclaim applications, Our TOC systems have the flexibility to serve indoor or outdoor installations . Our stainless ultraviolet systems are a safe and effective alternative for TOC destruction, providing low maintenance costs and utilizing non-toxic UV light with minimal byproducts. The Stainless Steel Series UVs are ideal for ponds, aquariums, and water features. These units are constructed of SUS304 or 316L Stainless Steel electropolished and passivated. Stainless steel units have features that allow for quick installation and easy maintenance. Our Ultraviolet / UV will clear your water in 3-5 days, sometimes overnight, and keep it that way. Performance is guaranteed when sized, installed and operated according to our instructions.